When I started the visa application for India, I noticed that I had to answer several questions regarding my connection to Pakistan. Filling out the required forms, the Indian government inquired on whether the applicant had familial descendents of Pakistan or not, including grandparents, parents and spouses, and if the applicant had ever visited Pakistan. The repetitive questioning about Pakistan in the visa process ignited my interest in learning more about the relationship between the two countries. Admittedly, before coming to India, I was unaware of the continual animosity between the two neighbors that dates back to the independence of both countries in 1947. After the British withdrew its ruling from the Indian subcontinent, the land was separated mainly on the basis of religion with Muslim-majority Pakistan and Hindu-majority India. War immediately followed this division of territory. The first dispute between India and Pakistan was over controlling a region in the northern part of the Indian subcontinent, known as Kashmir. The quarrel over Kashmir has persisted to this day, leaving the relationship between the two countries unceasingly strained. Kashmir is desirable because of its geographic location, which provides various ecosystem services. While there are multiple factors that have incited the long-standing enmity between India and Pakistan, the conflict is deeply rooted in the fight over natural resources. The fight to meet the needs of the people living around Kashmir sacrifices the lives of those within the Kashmir boundary. Kashmir is in the hands of many; the small territory is partially possessed by three countries: India, Pakistan and China. Around 45% of the land is owned by India, which compromises the southern and eastern parts of the territory. Pakistan owns 35% of the land, including the areas of Azad Kashmir, Gilgit and Baltistan. 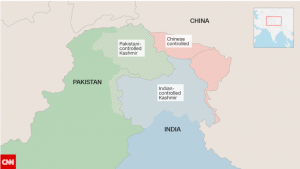 This leaves China with the remaining 20% of the northeastern regions of Kashmir. The consistent feud over Kashmir makes one ponder what the small territory has to offer to all of these countries. The answer lies in the different environments present within the territory that provides several benefits to people. This mountainous region is filled with dense forests, plains, rivers, springs, lakes, glaciers and valleys. The mountains in the region promote climate variation, which then leads to a diversity in environments. Kashmir valley is heavily surrounded by forest. Most of the trees in these forests grow fruit as Kashmir is famously known for its fruit production. Besides fruit cultivation, the land of Kashmir also grows plenty of rice, wheat, maize and saffron. Another unique geographic fact about Kashmir is that it contains the largest freshwater lake in India. This massive lake is called Wullar Lake and stretches from Bandipore to Sopore for an overall length of 75 kilometers. There are six rivers that run through Kashmir. Without these rivers, Pakistan’s agricultural production crashes, posing a food security threat. These rivers provide more than just irrigation services; India wants the Kashmiri rivers for its ability to produce electricity. India’s desire for the occupation of Kashmir derives from the country’s need to construct more hydroelectric facilities. With around 1.3 billion people living inside of India’s walls, India is looking for more water sources that will help the country in providing electricity that matches its massive population size. In both cases, the Kashmiri rivers are being used to meet the needs of each country’s citizens. Of all the natural resources that Kashmir has to offer, ownership over water has definitely been the most problematic issue so far between India and Pakistan. Complications over the use of Kashmir’s rivers erupted immediately after the birth of both countries because of how the territory lines were drawn. These borders were determined by the British without any input from the colonized territories. The handling of the rivers were first managed by the Inter-Dominion accord in 1948, which mandated India to supply Pakistan with an adequate amount of water. In return for this water, Pakistan paid the Indian government each year. Failing to properly mitigate the water-sharing problem, the two countries sought international aid twelve years later. The Indus Water Treaty, which was arranged by the World Bank, was devised to resolve the conflicts of water usage between the two countries. Under this treaty, India was given the Beas, Ravi and Sutlej rivers while Pakistan was granted the Indus, Chenab and Jhelum rivers. Many consider this treaty as successful and an exemplary model for how future water conflicts should be handled. However, the treaty has not stopped the bickering between the two countries. Both countries have their benefits and losses from being a part of the treaty. Pakistan has an advantage over India in some sense because the treaty gave Pakistan a larger catchment area. 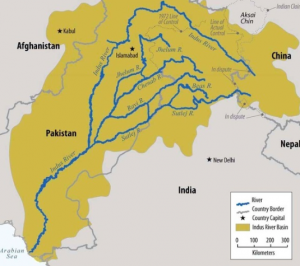 In the dividing of the rivers, Pakistan received a 56% catchment area whereas India only has 31%. India has the upper hand in its ability to use some of Pakistan’s granted rivers, but only for consumption purposes. Using the river for constructing storage and irrigation systems is not permitted. Also, certain components of the treaty leave some circumstances unclear. For example, one rule in the treaty states that India is forbidden from constructing storage systems, except in extremely special cases, yet there is still uncertainty over what these special cases include. This has led to a pattern of India starting water projects, and Pakistan reporting India for violating rules outlined in the treaty. The current prime minister of India, Narendra Modi, has recently employed water as an assertion of power and dominance over Pakistan. Enraged by the death of 18 Indian soldiers killed by militants, Modi was pressured to prove to Pakistan that these violent acts are unacceptable and will not be tolerated by the country. Instead of using an armed approach, Modi decided to turn to water as a way of making Pakistan feel inferior. After these attacks, the prime minister commanded that India seek all opportunities to exploit the absolute most of the contested waters. Modi’s intentions of avoiding violence in India’s relation with Pakistan have been shattered as he has brought the lifeline of everyone, water, into the complicated mix. The common expression of “history repeats itself” applies to this situation as well. Water-sharing conflicts are nothing new, and these disputes rarely end in a peaceful manner. There are global examples of how brutal fighting can arise from water-sharing issues; however, one can look within India’s own walls to notice this pattern. 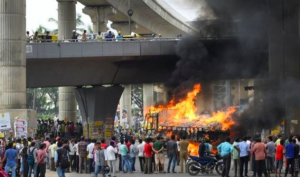 In September of 2016, several vehicles were set on fire and two people were killed in the southern state of Karnataka. What was the reasoning behind these violent acts? It was over water-sharing. Karnataka and Tamil Nadu both use the water flowing through the Cauvery River. However, the Cauvery basin was not blessed with heavy monsoon rainfall unlike most other places in South Asia that year. During that same year, the Supreme Court decided that Karnataka release the water from its dams to the nearby state of Tamil Nadu. Worried about the livelihood of both the crops and the residents in the region, protesters were outraged by this Supreme Court order. Modi should have been more considerate of the past and aware of the potent ability of water. In fighting to control the bountiful land of Kashmir, both India and Pakistan have infringed on the rights of those living inside the contested territory. The animosity between the two countries are most felt by Kashmiris. Civilians have been abused or killed because of the battle between the insurgents and the security forces that is occurring inside of the Indian state of Jammu and Kashmir. The lack of confinement of security forces who have committed serious human rights violations has become a pressing issue for both countries. 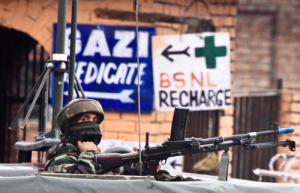 In order to combat the riots that hope to derail India’s control over the region, India has packed its granted proportion of Kashmir with security personnel. The number of security personnel drastically exceeds the number of residents living in Kashmir with a ratio of 7:1. High-level officers in the military and police force have been abusing their powers and severely threatening the lives of Kashmiris. The helpless Kashmiri people have been illegally killed, tortured, raped and kidnapped by security forces in the area. From just 1989 to 2006, the Association of Parents of Disappeared Persons has estimated that around 8,000 to 10,000 people have gone missing. The majority of these “disappeared” people are eventually killed or tortured to the point of death by security personnel, leaving family members with the false hope of seeing their loved ones again. Blood has been spilled by 60,000 people in Kashmir within the span of just twenty years. Yet, rarely are any of these personnel punished for their immoral actions. Amnesty International has charged India with failing to imprison security personnel who have violated the liberties of Kashmiris. Despite having committed the crimes, people in the military and police forces are only found guilty 4% of the time. Similarly to those living in India’s part of Kashmir, the residents in Pakistan’s part of Kashmir are also deprived of their basic rights. In a lecture given by Dr. Gracey at Madras Christian College, she discussed how Pakistan was increasingly becoming a haven for terrorist activities. Terrorist groups, such as the Taliban and al-Qaeda, have aimed their atrocious acts toward people of various backgrounds in Pakistan, leaving almost no one safe. To combat these terrorist groups, Pakistan has created counterterrorism initiatives. However, these measures have costed the Kashmiris in the region their basic right to speak freely of their own opinions. Limiting people’s freedom, the Pakistani government passed the Prevention of Cybercrimes law, which gives the government an enormous amount of authority over its citizens’ online activities. Any expression for independence from both India and Pakistan will be quickly hushed by the Pakistani government while publicizing Kashmir be fully controlled by Pakistan is permitted. The underlying cause of this adverse relationship stems from both nations’ concerns with supplying their people with basic needs, such as food and water. With Kashmir’s abundance in essential resources, the likelihood that either country will give up such a valuable piece of land is not probable. There is little hope for a better life for Kashmiris as they reside in a land that will forever be contested. Gracey, Marilyn. (2017). India and Her Neighbors. Lecture, Madras Christian College International Guest House, 24 October 2017.